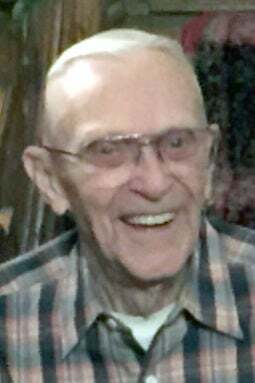 Harold J. Retland, age 93, of Fremont died Sunday, March 10, 2019, at Dunklau Gardens in Fremont. Harold was born April 14, 1925, to Lars and Julia Retland in Adams County, Iowa. He was raised on the farm and continued working there until he married Verna Wilkie on Nov. 25, 1951. After their marriage, Harold continued to farm in the area until moving to Fremont in the late 1950s. While in Fremont he worked as a finish carpenter, then as an electrician until he retired. In retirement Harold enjoyed woodworking, and also traveled back to Iowa to the family farm to work. Survivors: wife, Verna of Fremont; daughters, Pam (Gary) Pettitt of Fremont and Linda (Chuck) Cochrane of Elkhorn; grandchildren, Rachel (Parker) Albaugh, Sydney and Cameron Cochrane. Harold was preceded in death by his parents, three brothers and a sister. Visitation will be Friday, March 15, at the Ludvigsen Mortuary Chapel beginning at 10 a.m. with a graveside service at Memorial Cemetery at 11 a.m.